For public servants whose roles require them to act in a nonpartisan manner, county officials rarely have the luxury of having grand philosophical discussions about the direction of the policy they enact. That’s something Rep. Stephanie Murphy (D-Fla.) sees in the position she has staked out in the U.S. House of Representatives. “The vigorous debate of ideas is great for democracy, but it doesn’t have an impact on that person (at home), whatever their needs are in my community,” she said Jan. 10 to the National Council of County Association Executives (NCCAE) during its winter meeting in Washington, D.C.
She and Rep. John Katko (R-N.Y.), two members of the Problem Solvers Caucus of moderates in the House, explained how their group of 48 legislators hopes to keep the country moving. “It’s like walking down the middle of the road,” in that you can be hit by cars going either direction, she said. 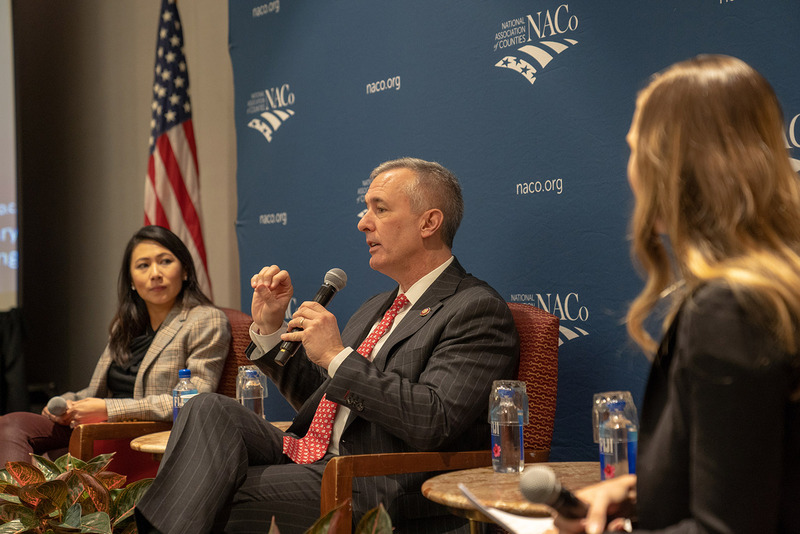 Katko agreed and said that resisting the extreme wings of either party was crucial to crafting legislation palatable to both parties. A divided Congress gives bipartisanship a chance, and an opportunity to enact long-lasting legislation. Katko goes as far as to not sponsor legislation that can’t find a Democrat to join him. Murphy, who has fought for a House rules change that will guarantee floor time to bills with significant bipartisan support, said that even when one party takes control, unilateral action is ill advised. Both represent congressional districts that are relatively evenly divided, keeping them on their toes and forcing them to be responsive to their constituents’ practical needs, rather than partisan rhetoric that gets airtime. “It’s easy to talk about bipartisanship but hard to do,” Murphy sad. “It’s like a kindergarten playground,” sharing a swing. “When you’re in the minority, it’s easy to talk about bipartisanship, but when you’re in the majority,” things are different. Kakto, who hadn’t planned to go into politics, keeps his career perspective in mind as he figures out his latest job in Congress and his competitive district.